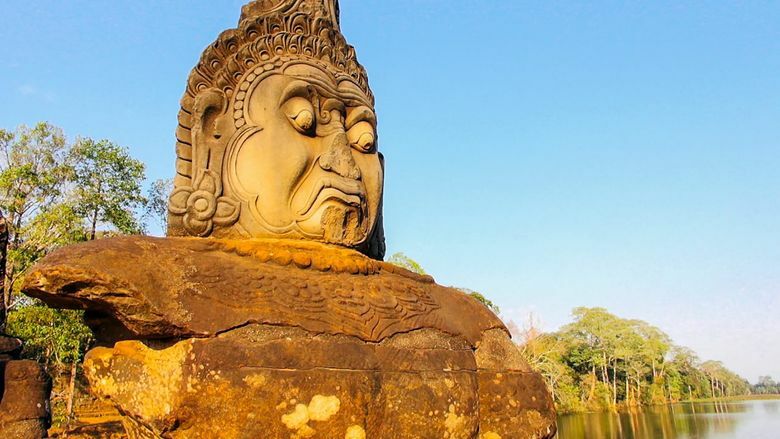 Cambodia’s rich history is reflected in temple faces such as this one. This historical documentary offers insights into the rise of the Khmer Rouge in 1970s Cambodia, and how the nation has not fully come to terms with its years of genocide. Rated 4 stars out of 4. When lengthy genocides finally end, survivors sometimes refuse to share information with upcoming generations about what they endured. On a national level, that collective amnesia can make it difficult for a country to move forward and teach younger people cautionary lessons. That’s a big part of the premise of “Angkor Awakens: A Portrait of Cambodia,” a riveting and illuminating documentary about the rise of the Khmer Rouge in the 1970s and how its shockingly mad and bloody legacy continues to impact Cambodia today. Modern Cambodians are an outwardly smiling and accepting people, several observers say toward the film’s end. But scratch the surface and you’ll discover a simmering, post-trauma violence. Made by Cornell physics professor and documentary filmmaker Robert H. Lieberman — who directed the well-received, 2012 “They Call It Myanmar” — “Angkor Awakens” weaves a historical and psychological tapestry of a long-beleaguered nation. ‘Angkor Awakens: A Portrait of Cambodia,’ Directed by Robert H. Lieberman, story by David Kossack. 90 minutes. Not rated, mature audiences. Seven Gables. Using abundant archival footage and including scores of interviews with ordinary Cambodians, former officials and sundry experts, the film reveals a peacetime country whose flowering in the 1950s and ‘60s, economically and culturally, was undone by American bombing during the Vietnam War. Lieberman goes on to explain how a pro-U. S. strongman staged a coup but was then driven out by the Marxist Khmer Rouge. This backdrop gains human dimension as we hear the memories of survivors who initially welcomed the Khmer Rouge as saviors only to find that it was driven by radical ideology, anti-intellectual fervor and murderous paranoia. In a way, this is really the story behind those famous images of countless human skulls left over from the brutal slaughter of millions. In the end, Lieberman is primarily concerned with what today’s younger Cambodians know and don’t know about those dark days. His interviews suggest such awareness is spotty, and that a nationwide catharsis is overdue.